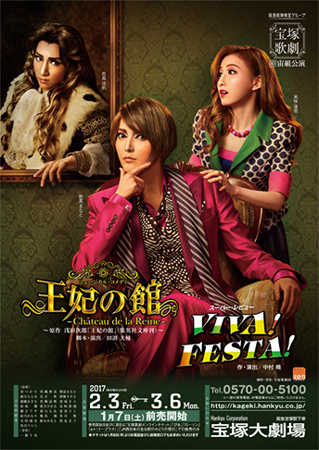 English Title: Chateau de la Reine (The Queen's Chateau) / Viva! Festa! Japanese Title: 王妃の館 / VIVA! FESTA! Romanized Title: Oohi no Yakata / Viva! Festa! Based On: The novel of the same name by Asada Jirou, and the 2015 film of the same name. Our story takes place at the Chateau de la Reine, or "The Queen's Chateau," a property left behind by Louis XIV of France, the "Sun King." It is a comedy originally penned by Jiro Asada in the novel of the same name, in which he portrays a web of human relationships formed by a group of singular characters. Now the Takarazuka Revue is giving this best-selling story its own unique spin by turning it into a musical. The Chateau de la Reine is a luxury hotel tucked into a corner of the Place des Vosges. The hotel has very high standards for its clientele, but the establishment has in fact fallen into serious financial trouble. This state of affairs attracts the attention of Pan World Tour Enterprises, a travel agency on the verge of bankruptcy. The two businesses team up to come up with an audacious and unprecedented plan to double-book tours, by which they cunningly book guests from two tours—the high-priced Light (Positive) Tour and the cheap Shadow (Negative) Tour—in the same rooms. But all they get are troublesome, difficult guests, including an eccentric, popular novelist. All sorts of chaos erupts as episodes involving a former Châtelain and King Louis unfold. When all is said and done, where will these people, so confused about love and life, end up? It's a festa where people escape from their everyday lives to celebrate all the things that make life worth living: prayer, appreciation, hope and more! The theme of this Super Revue is the festa of the world, including Rio's Carnival, Walpurgis Night from North and Central Europe, the Running of the Bulls in Spain, and the Yosakoi Soran Festival of Japan. Audiences will witness the compelling power of the Cosmos Troupe in numerous ways. Welcome to the festa of the Cosmos Troupe, led by Manato Asaka. Final performance for top musumeyaku Misaki Rion. Chateau de la Reine was the Grand Theater debut for director Tabuchi Daisuke. Information and trailers for the 2015 film can be found at Asian Wiki. † Due to injury, Hanabishi Rizu was out for the entirety of both the Grand Theater and Tokyo Theater runs. ‡ Due to injury, Koko Sakura only performed from Feb. 3 - 6, then was out for the rest of the Grand Theater run and the entire Tokyo Theater run including shijinkouen. She was scheduled to appear as Petite Louis but following her injury it was announced that Mizune Shiho would assume the role. § Due to injury, Matsukaze Akira did not appear in the Tokyo run of the revue show "Viva Festa!" She did, however, perform in the musical "Chateau de la Reine." Viva! Festa! was revived in 2019 by Cosmos Troupe as Viva! Festa! in Hakata. Created by caithion. Last Modification: Monday 25 of February, 2019 06:22:14 PST by caithion.